Used omega Omicron-EL 50mm f2.8 Enlarging Lens for 35mm Negatives. 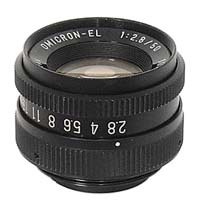 Excellent quality 6-element Omicron-EL 50mm lens, the standard focal length for 35mm negatives. These lenses feature sturdy metal barrels, eight-bladed diaphragms and positive click stops. Made in Japan for Omega. For additional information on Omicron-EL enlarging lenses, please click here. These lenses are used and may have minor cosmetic marks on the barrel from previous use, but all used lenses sold by KHB Photografix are carefully inspected and are in perfect working condition. We provide a 6-month warranty. Note: These lenses are not supplied with a retaining ring. If a 39mm retaining ring is required for your application, it may be purchased as an accessory - please see the separate listings under "Rings and Adapters".